There are three types of folding bikes. On one end of the scale, there is the folding bike that concentrates completely on the fold and ride quality is therefore a secondary consideration. At the other end of the scale is the bike that is designed for riding but that you can also fold if you have enough time and the right tools to hand, in other words a bike that you wouldn’t want to fold multiple times per day. In the middle are the folding bikes that try to achieve a compromise between folding and ride quality. They are easy to fold; they ride well enough, but the folded package is not as small as others. Bromptons are very much at the first end of the scale, with Airnimal Joeys at the other. Dahons and Birdys fall in the middle. A Brompton is one those products that is quintessentially British, both in the way it looks and in the way it’s been put together. Brompton designs and builds in West London and they are also reassuringly honest and transparent about their offering. Brompton weights, for example, are known to be the actual weight of the bike including pedals and mudguards and such like (between 9 and 12.5kg, if you want to know). Bromptons, in terms of how they are built and how you order them, are best described as "a bit different". Three quarters of the 1,200 parts that make up a Brompton are unique to them. On the one hand, this means that everything is engineered specifically for the job it needs to do. On the other hand, you can only get the spares from Brompton. An example of this potential issue is when the lower jockey wheel fell off the chain tensioner on our test bike because the bolt that holds it on had worked loose. This is a non-standard bolt, which means my part box couldn’t fix the problem and a trip to the bike shop was necessary. With a good dealer network across the UK, luckily this isn’t usually a problem. Ordering a Brompton, you can either buy off the shelf from one of the key models or you can use their custom route, called Bspoke. This allows you to specify handlebar type, number of gears (and even the gearing, to a certain extent), saddle, seatpost, luggage options and so on. This, of course, means that the bike has to be made to order and you’re looking at a lead time that is likely to be in the order of 2-3 months. Colours can be chosen from a fairly long list at extra cost. Brompton are a one size fits all – different rider heights are accommodated by moving the saddle up and down while a telescopic seatpost is available if the standard one is not long enough. Of course, seat height is not all there is to bicycle geometry – if you’re tall you might want to test ride to make sure you can live with a reach that is going to be relatively short for you. The particular model we have is the 2-speed Superlight (titanium forks and rear triangle) with mudguards. You can get it with a titanium seatpost too. There are a few things that seem a bit peculiar at first, like the combination of a 3-speed hub gear with a 2-speed derailleur to achieve six gears. Or the very recognisable shape. Or the ingenious fold. None of these things are wrong, just a bit odd. This ingenuity and oddness has rightly earned the Brompton lots of design awards as well as a Queen’s Award for Enterprise in both the Innovation and International Trade categories. The fold seems to be what gets talked about most when Bromptons are discussed. And rightly so. The fold is what it is best at – it’s a “killer feature”. 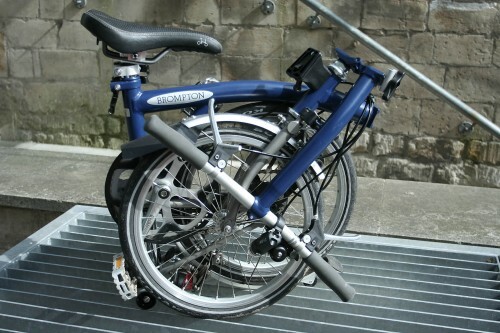 The Brompton fold takes four steps (and the order is important): flip rear triangle under frame, fold main frame tube back on itself to hook onto folded rear triangle, slide seat post down to lock the previous two folds in place and, finally, fold steerer tube in half and click into latch to hold it in place. If you have a folding pedal, there’s an extra step to make the package even more compact. Doing the steps in the right order takes a little bit of getting used to – not very long. And it’s worth it. This is the most impressive fold I have seen: the most ingenious (it neatly hides vulnerable cables and greasy chain and gears), the most compact (58.5cm x 54.5cm x 27cm), the most solid (everything is locked in place) and the easiest to carry when folded. Important, that last one, as I know from experience with my Dahon Helios that you actually end up spending a lot of time carrying the bike folded. Because the inside pedal is folded away (if yours has this option) and the weight is centred to the right of the saddle, this bike is remarkably easy to carry. This was a very pleasant discovery. The saddle ours came with has little ridges under the nose for your fingers to fit in which is a handy detail. In fact, Brompton are quite good at nifty little details. The shifter and bell combination for example, or the aforementioned folding pedal. The fact that the fold is locked and won’t come undone, not even a little. The rear triangle is locked in place when unfolded on our model as well, which means carrying the bike unfolded – down a flight of stairs, for example – doesn’t mean the rear triangle keeps kicking into you like it used to on older models. 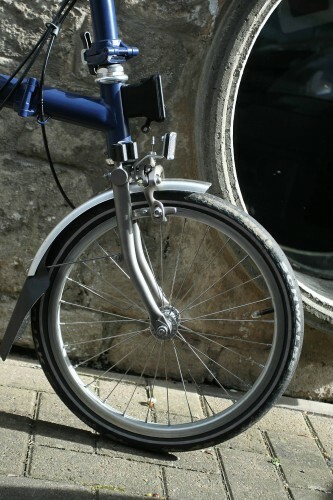 The first part of the fold – flipping the rear triangle under the frame – allows the bike to be “parked”. Brompton have the best thought out luggage options out of any folder too: there’s the bag that clips onto the (custom) bracket on the steerer tube and the custom rear rack. "Custom" meaning: “buy from Brompton” and “not cheap”. Robust, though. If you are planning on buying accessories for your Brompton, such as bar-ends, or lights, think carefully where you are going to put them before you buy. Everything on a Brompton – and this is true of any folder – is positioned where it is for a very good reason: so as not to hamper the fold. You might find that your bar ends or lights will not fit quite where you’d like them. The ride, then. As I mentioned above, this is where I feel there’s a bit of compromise. Having 16in wheels enables a tighter fold, but they don't roll over irregularities as easily as larger ones. Sure, this is soaked up by the rear suspension, but this and the stemless design do make for a slightly twitchy feel. This is especially noticeable if you’re going slowly – low speed manoeuvring feels different than on other bikes. At higher speeds this is hardly noticeable; you can quite happily zoom down hills with confidence. Just to put this in context, one bloke has successfully ridden Paris-Brest-Paris on a Brompton – a 1,200km (750 mile) ride that has to be completed in under 90 hours; it’s a fully functional full-size bike. In terms of components, in my opinion their quality does not reflect the price of this bike. This is obviously not where the money goes. Gear changing is a bit sloppy and lacks immediacy, braking is adequate but not impressive, the brake levers don’t feel ergonomic and are quite far away from the bars for somebody with relatively small hands like me. I can’t comment on the build quality of the wheels – while I had no problems, I didn’t have the bike for long enough to make a judgement on this. As a side note, the version with 2 gears (74in and 54in) is not really appropriate for hilly areas. I would assume that the six-gear version, especially in the -12% variation, would be more than adequate. I also have to say that I had a couple of mishaps with this bike. The first was that the nut and bolt that holds the shock dampener onto the rear triangle came loose, and “unheld” the aforementioned. Not a big problem – the local bike shop had a nyloc nut that fitted. The second problem was that the nut and bolt that holds the jockey wheel on the chain tensioner came off, sending the jockey wheel flying. Unfortunately, this is not a standard part and required a trip to a Brompton dealer. Both incidents rendered the bike unrideable for the rest of that journey. In its defence, the test bike we were sent was not new and, I would imagine, has been shipped around the place for various people to test it. I will put the jockey wheel issue down to the lack of a regular service and assume this wouldn’t happen to a regularly bought Brompton. On the whole the Brompton is a really neat package – especially if the fold is as important to you as the ride. I would recommend the Brompton to anyone who wants to speed up their journey to and from train stations or wanting to cheat the traffic by driving part of the way and doing, for example, the inner city bits by bike. The Brompton has the smallest fold out there, so if space is at a premium, this is the folder for you. Did you enjoy riding the bike? Yes, although more gears would have been good! Would you recommend the bike to a friend? Yes, depending on their needs. I've just bought a Brompton (selected for the fold) but couldn't bring myself to spend a further £400+ for the titanium bits and 1kg weight saving, so went for the S2L. I'll be using this in the gentleman's folding bike races as well as the commute on the Thames footpath. First planned change is to fit a Brooks Flyer as the small wheels bounce painfully over the Docklands' cobbles. Where's the smiley of someone rubbing their 'contact points'? Your comment on the bike being unridable is a bit unfair. 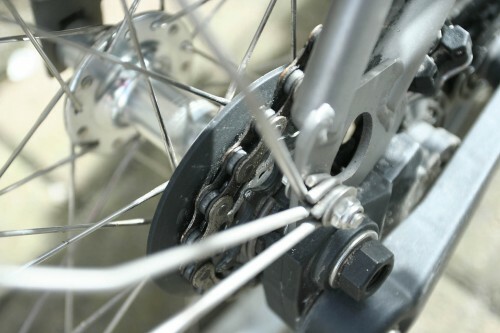 The chain can be shortened and still drive the rear wheel - it will fall off when you fold the bike - but you'll get home. 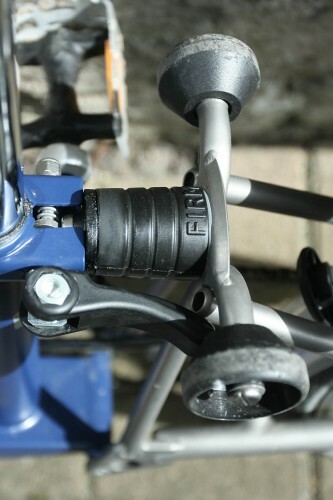 The rear suspension bung can be held against the seat clamp with a toe strap or string and spanish windlass. And one detail you may not have realised - Bromptons might not have been around quite as long as the Dualit toaster, or the Kenwood Chef but just like these products you can roll in to a Brompton Dealer with a 1988 Brompton and get spare parts that fit (although some might be slightly improved on the original design). Ask yourself how many other makers offer that sort of product support. CTC counts at Waterloo suggest that 40% of the bikes passing through the station at the morning peak are Bromptons, and many people have more than one machine to suit their different journey types. The Brompton Talk list provides a users' forum and is itself nearing its 10th birthday, but expect some very off-the wall postings. Bromptons remain a serious form of folding transport for both serious and non-serious cyclists, which is quite an achievement. The basic machine is light, strong and, in S form, fast. Brompton have reluctantly flirted with change over the eight years since I last bought one. Some changes are welcome, others less so. Some we are still waiting for. The trolley wheels on the rear triangle are, as ever, cone shaped, which makes them good for catching your shoe or trousers as you pedal. Rubber is the wrong material for the mudguard wheel, because it makes the thing hard to steer when you are wheeling it half folded. The clip that holds the rear triangle up when the bike is unfolded is good. It makes the unfolded bike easy to carry with the saddle on your shoulder. The front clip that holds the bars in the folded position now works, which is nice. Dual pivot brakes fore and aft are a welcome addition, but stopping power is still rather variable, and the tiny pads wear fast in winter. The derailleur (2 or 6 speed models) is the biggest innovation, and it is not a complete success. Clever it may be in summer (two speeds are enough for flattish terrain), but mine gave up after half a German winter. The little rotating block that coaxes the jockey wheel from side to side forms a neat platform for grit to sit between the block and the adjustable stops. The whole assembly is fiendishly difficult to clean. More than once I've been left in dangerous positions in traffic with no drive as the thing hunts between one gear and the other. Snow also confounds it far more easily than a hanging cage derailleur. The plastic parts, including the thumb switch, will not survive a shunt. So for poor conditions, go for the 1 or 3 speed. To infuriate its customers, Brompton still use hex bolts on brake cable clamps instead of Allen bolts. Thank you, Brompton. The standard top gearing is still too high on all Bromptons. On the 2 speed, bottom gear is right, but the gap between ratios is too big. This is easy to change and sprockets are cheap. On the 3 speed, order a gear reduction, or change the chainring (non-trivial). The new saddle is a vast improvement, but the Brompton-specific rail clamp setup comes loose, so another own goal there. The standard rear battery powered light is pretty good. The front one (S-Sun, it's called) is not; I won't bore you with the details. Most infuriating is Brompton's patriarchal attitude toward its dealers (and by extension to its end customers) whom it prevents from supplying overseas, presumably to attract more overseas dealers. This royally screwed me. I complained, and they more or less told me that they couldn't care less. True, the bike is good enough that they just don't need your business. Very good, could be better. I purchased a titanium model about two years ago and have spent some time changing all the nuts and bolts etc for alloy and titanium. I also changed the saddle, bottom bracket, seat tube clamp for lighter models. This makes it much easier to carry and a little easier to ride up hills. I was intrigued when I rang Brompton to find out if they had a service manual which would give me all the thread sizes to find out they didn't have a clue what they were. I agree with most other reviewers that the build quality could be much better and producing a really well made top model would be a bonus. I use mine quite a lot for work and a trip up our local cycle path by our showroom in the evenings. It's a great product but like most manufacturer's they know better !!! and don't listen to the users. I'm no expert by a long shot but do own a Brompton and have been using it for 2 years as a compact solution that enables me to leave one house sunday evening, commute to my other place by train and from there, use it for the daily commute to the office and local transport. Taking a cool look at things, yes, on a technical level it's certainly ridiculously overpriced -I've no doubt people have done Paris-Brest on them but then again, some guys like a good whipping for sports- and if you want to get a version that's actually manageable (meaning the 6-speed and the easy wheels) then you're quickly looking at a sizeable chunk of disposable income. It has one redeeming quality: it folds away really quick and compact so for multimodal transport and discreetly storing it under a desk or taking it into a restaurant it's basically the only game in town. I tried a Dahon and a cheap Chinese import which will remain nameless. Didn't like the fold on the Dahon and the Chinese bike was simply dangerous to ride, I kept wondering when it was going to fold -no pun intended- while I was barreling down a hill on my morning office commute. Wouldn't recommend a Brompton for any commute longer than 10 km or over difficult terrain though. And you have to be able to take it inside wherever you're going, they're thief magnets due to their high resale value. If you can't take it with you then I'd recommend paying extra for insurance, a good lock and a discreet gps-transponder. I've done just over 1,000 miles on my 6-speed Brompton since I bought it last autumn, and it has revolutionized my commute - which is 15 miles round trip Waterloo to NW10. The fold is indeed the key, especially the way it keeps the chain tucked away from clothing. Recommended. I purchased this bike from On Your Bike, which is located at London Bridge. My folding bike runs smooth and gives me full of comfort when I ride. If you are a beginner to ride a folding bike, so it is the best choice for you. You can also buy this bike from this web store, where I was purchased.